Turkey's northern Trabzon province -- a big tourist attraction with its Uzungol (Long Lake) and Sumela Monastery -- welcomes visitors from all over the world. Ali Ayvazoglu, the provincial head of the Culture and Tourism Ministry, told Anadolu Agency that visitors choose Trabzon not only for its natural and historical beauties, but also for mountains and tablelands. Ayvazoglu said over 2 million local and foreign tourists visited Trabzon in 2017. He added there are a total of 519 hotels with a bed capacity of 31,113 in Trabzon. "Efforts continue to increase the bed capacity depending on the increase in the number of tourists," Ayvazoglu said. He said there are investments on new accommodations. "With the completion of the investments, Trabzon will continue to be a shining star and will be even more prominent in the tourism area," he added. Located in the Macka district of Trabzon, the Sumela Monastery is a site of historical and cultural significance as well as a major tourist attraction included in UNESCO's temporary list of World Heritage sites. 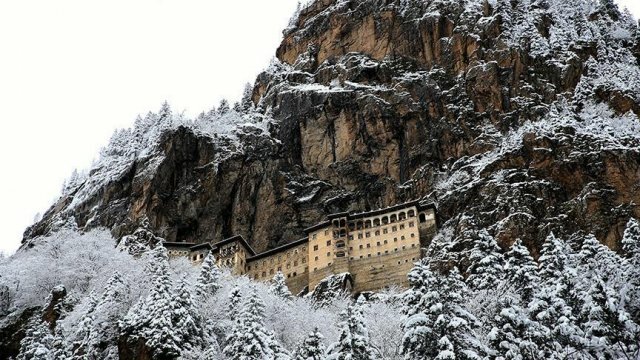 Built on a steep cliff at 1,200 meters in Altindere National Park, the Sumela Monastery reopened for religious use on Aug. 15, 2010 with the permission of the Ministry of Culture and Tourism, following an 88-year hiatus. Also, Uzungol (Long Lake), located in a valley between the mountains in the Caykara district has become a visit attraction. Besides its natural beauty, tourists may find chance to try many activities, including paragliding, trekking and cycling.